Whether you’re a professional landscaper looking to improve your customers greenspace, or you’re a homeowner looking to completely remake your bumpy, weed-infested lawn, establishing new turf from sod is a quick way to enhance the curb appeal of any property. In this feature, we’ll walk through the sod installation and maintenance processes. We’ll also explore which fertilizers and soil amendments you should use to help your sod quickly adapt to its new home. Let’s get started! There are advantages and disadvantages to establishing a lawn from either seed or sod. Typically, establishing a lawn from seed is less expensive, however it can take several months for grass seed to germinate and bulk up, leaving your yard covered in straw. Sod can be installed almost any time of year because its complex root systems are better able to withstand abiotic stresses (such as heat and mild drought). The most significant advantage is the look and feel of a finished lawn within a day or two. Most grass varieties that are available for seeding are also available in sod form. It is important to choose a variety that is well adapted for your climate and local environment (sun vs. shade levels on property). One of the more popular cool season grasses used in the northern United States is Kentucky Bluegrass, however it should be noted that this variety does not perform well in extreme heat and drought. If selecting Kentucky Bluegrass, it is highly recommended to keep this variety adequately irrigated. See the lawn grass comparison chart to assist in choosing the right Sod for you! No matter the reason(s) for beginning a new lawn from sod, it is imperative that the ground be properly conditioned to give the sod the best chance for thriving. The best times of year to sod are spring, later summer, and fall. If removing an old lawn, first use a wide-spectrum all purpose herbicide (such as glyphosate). This will kill all pre-existing grass and weeds. This step typically takes a few weeks to complete. Once you are certain the lawn and weeds are dead, you can use a gas-powered sod cutter to undercut the grass and weeds, freeing them from the topsoil below. Dispose of appropriately. If the soil is alkaline, adjust with peat, compost, aluminum sulfate, elemental sulfur, or iron sulfate. When adjusting the pH, these soil amendments should be tilled into the top 2-3 inches of the top soil. If the soil is also heavy in clay or suffering from compaction, consider adding gypsum (example: TCS Gypsum #902817, #902816, #902815)to increase porosity. NOTE: even sandy soils are susceptible to compaction, so avoid compacting soils with heavy equipment as much as possible. Next, make sure the top soil has been leveled and smoothed; this will ensure the underside of the sod has maximum contact with the top soil. During this process (once again), avoid compacting the soil as much as possible. The last step in ground preparation is to spread a starter fertilizer across the top soil. There is no need to rake it in, as the sod will be placed directly atop the fertilizer. Consult the grower for sod-specific fertilizer recommendations. IMPORTANT: DO NOT DEPLOY ANY FERTILIZERS WITH PRE-EMERGENT HERBICIDES, AS THESE MAY HINDER ROOT DEVELOPMENT IN ESTABLISHING SOD. Once the ground has been adequately prepared, it’s time to take delivery of your sod. Sod is typically harvested within 24-48 hours of being installed. 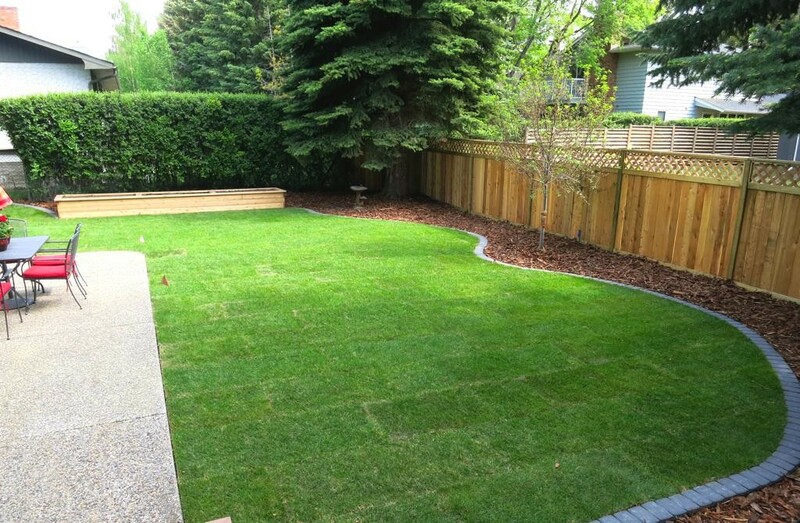 Most sod comes in the form of large rectangular sheets. These sheets are rolled or stacked, then transported direct to the installation site. It is critical that the sod be installed within 48 hours of harvest. Beyond 48 hours, sod starts to desiccate, as well as suffer from lack of sunlight. Before starting, make sure the soil is either dry or slightly moist. IMPORTANT: Never lay new sod down on saturated soil; this can lead to compaction, drainage issues, and the potential for fungal outbreaks under warm conditions. When installing sod, orient the sheets in a staggered formation, just as if you were laying bricks. Make sure sod edges are tightly pressed against each other. As sod begins to dry out, each sheet will shrink leaving gaps between sheets. These gaps are unsightly and create the perfect environment for weeds to grow. This can be avoided by molding the edges of adjoining sod pieces together, much like molding two pieces of clay into each other. 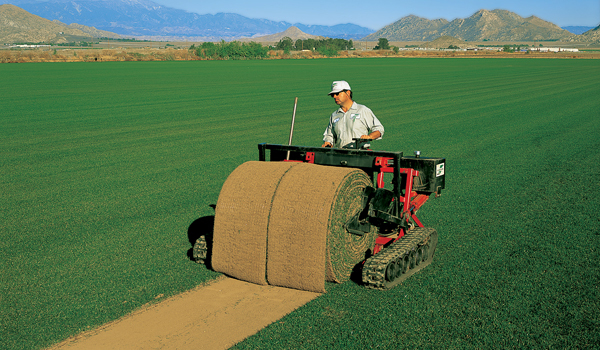 Once the sod has been deployed, use a roller to press the sod firmly against the top soil. This will accelerate root growth by eliminating air pockets and create a smoother, more level lawn. The last step is absolutely the most important: water well! New sod need lots of water, more so than lawns starting from seed. In general, sod should be watered 3 times a day during the first week, twice a day during the 2ndweek, once a day during the 3rdweek, and then as needed beyond week 3. Failing to provide sod with adequate water during rooting could causing yellowing, and in some cases, the death of an entire sod sheet. You’ll know the sod has rooted well once the sheet resists any attempt to lift it off the ground. IMPORTANT: Don’t forget these great follow up tips to keep your new sod in top shape! Keep foot traffic to a minimum until sod is well rooted (usually a few months). Use a pre-emergent herbicide in the spring to keep your lawn weed free through the year (don’t miss this step!). Use good lawn keeping practices through the remainder of the year. Give your new sod the edge with these fertilizer and soil amendment recommendations from Turf Care Supply!